GeoPoll is excited to announce that our Media Measurement Service has now launched in Rwanda, and is currently collecting daily data on TV, radio, and print audience measurement. GeoPoll’s Media Measurement Service is already running in five other African countries: Kenya, Ghana, Uganda, Tanzania, and Nigeria. GeoPoll is the largest provider of daily share, audience size, and ratings data in Africa, and with the addition of Rwanda, GeoPoll’s Media Measurement Service covers over 370 million Africans. Radio and print are particularly popular outlets in Rwanda due to the high cost of televisions. GeoPoll has measured the top radio stations in Rwanda for the past two weeks, finding that Radio Rwanda, the national public broadcaster, is the dominant player in terms of audience share*, with an average share of 49%. 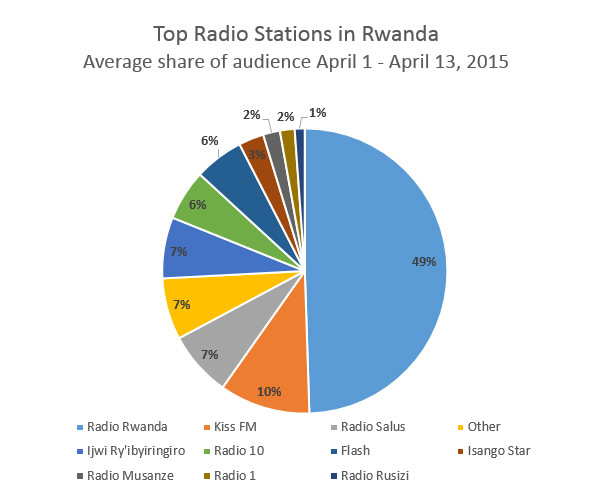 This means that almost half of the people listening to the radio at any time are listening to Radio Rwanda. Other popular stations include hit music station Kiss FM, with 10% share from April 1st-13th, Radio Salus, 7% average share, and the Christian station Ijwi Ry’ibyiringiro, 7% share. To subscribe to our Media Measurement Service in Rwanda, contact GeoPoll today and a representative will get back to you shortly.